You’ve probably heard of nutritional supplementation, but are unsure of where to start or whether or not it’s right for you. 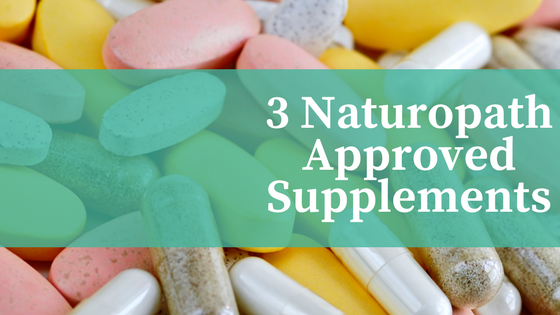 In this article we want to clear up some confusion around supplementation by outlining the top 3 supplements we regularly recommend in our naturopathic practices in addition to a well-rounded whole foods diet. 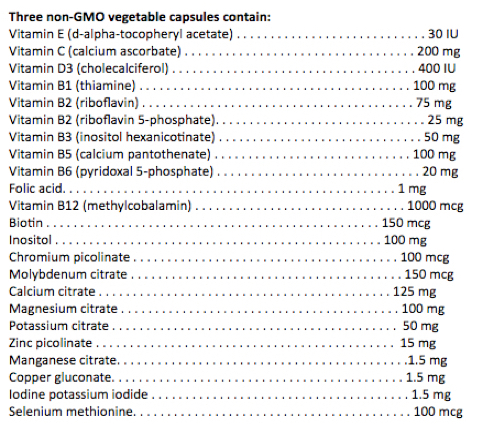 The purpose of a multivitamin is to fill in the nutritional gaps that you may be missing in your daily meals. Think of a multivitamin as an insurance policy. First and foremost, your nutritional requirements should be obtained from a whole foods diet. A multivitamin is recommended in cases where a healthy diet is difficult to maintain at least 80% of the time, and in cases of chronic digestive disorders where absorption of nutrients are impaired. Physician grade multivitamins contain well-absorbed high quality ingredients, and are free of dyes, preservatives and allergens. They also will have vitamin and mineral concentrations that go above the bare minimum recommended daily allowances (RDAs). Studies show that 40% of Canadians have insufficient vitamin D blood levels in the winter, and 25% have insufficient levels in the summer (1). This widespread deficiency is concerning, because vitamin D plays such an important role in so many areas of our health. Vitamin D helps maintain calcium balance and healthy bone mineral density, and plays a role in prevention of breast and colon cancer, cardiovascular disease in men, and seasonal affective disorder (2,3,4,5,6,7). Vitamin D also has a huge influence on the health of our immune system, and a deficiency of this critical vitamin can increase the risk of autoimmune disease and respiratory tract infections (8,9,10,11,12). 1. Lack of Sun Exposure. Our primary source of vitamin D is through sun exposure. When sun hits our skin, it triggers a biochemical process that produces vitamin D. However, with our modern lifestyle, we spend most of our hours inside, and when we’re in the sun we often cover up or wear sunscreen. On top of this, as Canadians, we receive fewer direct sunrays then in other parts of the world. 2. Few Foods Naturally Contain Vitamin D. Vitamin D is naturally found in very few foods, and these foods are typically lacking in western diets. Foods that have the highest vitamin D levels are fatty fish such as salmon, cod liver oil, and egg yolk. Diary and soy products are also commonly fortified with vitamin D.
3. Malabsorption. Vitamin D is a fat soluble vitamin, meaning your body has to be able to absorb dietary fat in order to absorb vitamin D. Chronic digestive concerns such as celiac disease and inflammatory bowel disease impair fat absorption and commonly lead to vitamin D deficiency. If you have not had your vitamin D levels checked through blood work, a safe maintenance dose is 1000-2000IU of vitamin D3 per day for prevention of deficiency. With known vitamin D deficiencies your naturopathic physician or family doctor may recommend higher vitamin D doses with close monitoring of blood levels. The benefits of omega 3 fatty acids have been extensively researched. They reduce inflammation in the body and help prevent against chronic diseases such as cardiovascular disease, cancer, arthritis, asthma, allergies and eczema (13,14,15,16,17,18,19,20,21). They also have a huge impact on our brain health, and have been studied for their beneficial effects on mood, cognition and behavior (22,23,24,25). Several sources of information suggest that human beings evolved on a diet with a ratio of omega-6 to omega-3 essential fatty acids of approximately 1:1 whereas in modern diets the ratio is 15:1 to 17:1 (26). Omega 6 fatty acids are inflammatory in nature and are found in high amounts in processed foods and refined oils, while omega 3 fatty acids are found in fish, flaxseeds, chia seeds, and walnuts. A key means of controlling inflammation in the body is balancing your omega 3 to omega 6 intake through diet and supplementation. You want to be particularly careful about the source of your omega 3 supplement because many of them contain heavy metals and are prone to oxidation/rancidity. The fish oil brands that we recommend have third party testing to ensure that their products are heavy metal free, and have not been oxidized. These brands include: Ascenta, Nordic Naturals, Carlson, Cytomatrix, NFH, and Seroyal. A healthy dosage for adults is 1000-2000mg of omega 3 per day. Each individual has a unique set of nutritional needs depending on their age, current state of health, and medical history. At Juniper Family Health we offer comprehensive nutritional assessments and testing to fine tune what dietary supplements are indicated for your individual needs. Please don’t hesitate to contact us if you would like to explore your nutritional requirements further! (1) Janz, T. et al. “Vitamin D Blood Levels of Canadians.” Statistics Canada Catalogue no-82-625-X, 2013. (2) Pazirandeh S. et al. “Overview of Vitamin D.” Up To Date, 2016. (3) Lin J. et al. “Intakes of calcium and vitamin D and breast cancer risk in women.” Archives of International Medicine, 167(10):1050-1059, 2007. (4) Gorham E. et al. “Optimal vitamin D status for colorectal cancer prevention: a quantitative meta analysis.” American Journal of Preventative Medicine, 32(3):210-216, 2007. (5) Giovannucci E. et al. “25-Hydroxyvitamin D and risk of myocardinal infarction in men: a prospective study.” Archives of Internal Medicine, 168(11):1174-1180, 2008. (6) Kerr DC. et al. “Associations between vitamin D levels and depressive symptoms in healthy young adult women.” Psychiatry Res, 30;227(1):46-51, 2015. (7) Melrose S. “Seasonal Affective Disorder: An Overview of Assessment and Treatment Approaches.” Depress Res Treat, 178564, 2015. (8) Rosen Y. et al. “Vitamin D and Autoimmunity.” Scandinavian Journal of Rheumatology, 18:1-9, 2016. (9) Antico A. et al. “Can supplementation with vitamin D reduce the risk or modify the course of autoimmune disease? A systemic review of the literature.” Autoimmune Review, 12(2):127-36, 2012. (10) Pelajo CF. et al. “Vitamin D and Autoimmune Rheumatologic Disorders.” Autoimmune Review, 9(7):507-10, 2010. (11) Zhao G. et al. “Low Concentration of Serum 25-Hydroxyvitamin D Associated with Increased risk of Chronic Bronchitis Among US Adults.” British Journal of Nutrition 107(9):1386-92, 2012. (12) Ginde AA. et al. “Association Between Serum 25-Hydroxyvitamin D Level and Upper Respiratory Tract Infection in the Third National Health and Nutrition Examination Survey.” Archives of Internal Medicine, 169(4):384-90, 2009. (13) Tajuddin N. et al. “Prescription omega 3 fatty acid products: considerations for patients with diabetes mellitus.” Diabetes Metab Syndr Obes, 19;9:109-18. 2016. (14) Yokoyama M et al. “Effects of eicosapentaenoic acid on major coronary events in hypercholesterolaemic patients (JELIS): a randomized open-label, blinded endpoint analysis.” Lancet, 369(9567):1090-8, 2007. (15) Zheng JS. et al. “Intake of fish and marine n-3 polyunsaturated fatty acids and risk of breast cancer: meta-analysis of date from 21 independent prospective cohort studies.” BMJ, 346:f3706, 2013. (16) Leitzmann MF. et al. “Dietary intake of n-3 and n-6 fatty acids and the risk of prostate cancer.” Am J Clin Nutri 80(1):204-16, 2004. (17) Cockbain AJ. et al. “Omega-3 polyunsaturated fatty acids for the treatment and prevention of colorectal cancer.” Gut, 61(1):135-49, 2012. (18) Dzielska-Olczak et al. “Antiinflammatory therapy in osteoarthritis including omega 3 and omega 6 fatty acids.” Pol Merkur Lekarshki, 32(191):329-34, 2012. (19) Bisgaard H. et al. “Fish Oil-Derived Fatty Acids in Pregnancy and Wheeze and Asthma in Offspring.” N Engl J Medicine, 375(26):2530-9, 2016. (20) Kremmyda LS. et al. “Atopy risk in infants and children in relation to early exposure to fish, oily fish, or long-chain omega-3 fatty acids: a systematic review.” Clin Rev Allergy Immunol, 41(1):36-66, 2011. (21) Geusens P. et al. “Long-term effect of omega-3 fatty acid supplementation in active rheumatoid arthritis. A 12-month, double-bling, controlled study.” Arthritis Rheum, 37(6):824-9, 1994. (22) McNamara RK et al. “Role of Long Chain Omega-3 Fatty Acids in Psychiatric Practice.” PharmaNutrition, 1(2):41-49, 2013. (23) McNamara RK. “Long-chain omega-3 acid deficiency in mood disorders: rationale for treatment and prevention.” Curr Drug Discov Technol, 10(3):233-44, 2013. (24) Messamore E & McNarara RK. “Detection and treatment of omega-3 fatty acid deficiency in psychiatric practice: Rationale and implementation.” 10;15:25, 2016. (25) Yurko-Mauro K et al. “Beneficial effects of docosahexaenoic acid on cognition in age-related cognitive decline.” Alzeimers Dement, 6(6):456-64, 2010. (26) Simopoulos AP. “The importance of the ratio of omega-6/omega-3 essential fatty acids.” Pharmacother, 56(8):365-79, 2002.